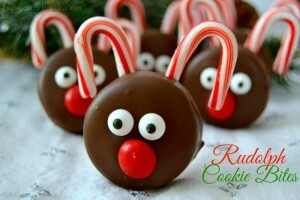 Fun and festive Rudolph Cookie Bites are easy to make and so much fun to decorate with the kids! No one will know how simple these adorable cookies were to whip up! Line a baking sheet with foil to use as your work space. Lay out all your ingredients ahead of time for ease of preparation. Melt the Chocolate CandiQuik according to package directions or until smooth and melted; set aside. Lay two miniature candy canes together in a V shape on the baking sheet with the tips of the candy canes touching and the arcs of the candy canes facing outward. Dip each Oreo into the melted Chocolate CandiQuik and allow excess chocolate to drip off. Using a toothpick, gently slide the coated Oreo off of the fork and onto the miniature candy canes to create Rudolph's antlers.